Black Box has been providing HR consulting services to medium and large companies since 2011. While the company primarily helps with talent management and process management, additional services include HR technology, talent strategy and HR program management. Black Box was eager to achieve a solid web presence that supported its growing business. Black Box Principal and Lead Strategist Andy Rice collaborated extensively with LyntonWeb to devise a way to present his offerings that most appealed to medium and large businesses while encouraging them to make the next step. LyntonWeb began building a new site on WordPress with embedded HubSpot forms, creating an architecture, designs and templates that would achieve all goals while presenting a sophisticated yet user-friendly look and feel. The new site’s look was important, but so was its functionality and purpose. Black Box wanted a site that would help the company evolve.LyntonWeb developed templates that provided plenty of room to grow as Black Box added more content assets. We also ensured the site showcased thorough details on each provided service, along with a solid next step for those interested in getting started or learning more. 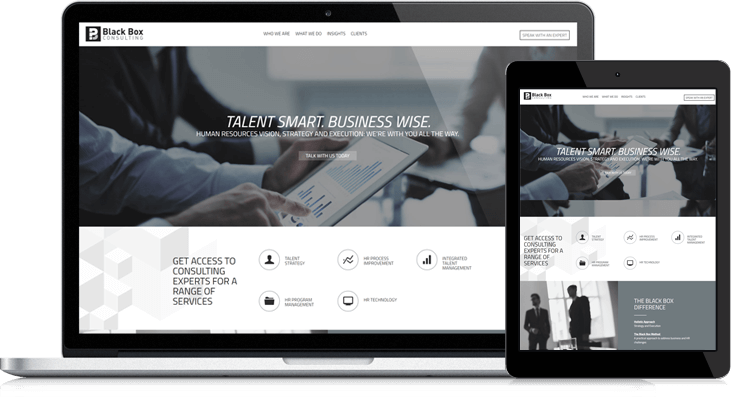 The revamped site provides the professional look and feel of a successful consulting firm, and does double duty as a marketing tool. With a continued focus on delivering for existing and newly attracted clients, Black Box intends to build case studies to further support its claims of excellence across the board.